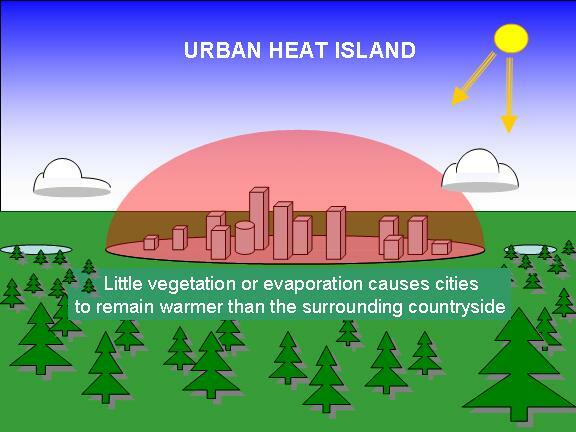 "Urban Heat Island" (UHI) refers to the tendency for a city or town to remain warmer than its surroundings, by as much as 10 deg. F or more. This effect is caused mostly by the lack of vegetation and soil moisture, which would normally use the absorbed sunlight to evaporate water as part of photosynthesis (a process called "evapotranspiration"). This is also the reason why forests are cooler than deserts. Instead, the sunlight is absorbed by manmade structures -- roads, parking lots, and buildings. With little or no water to evaporate, the sunlight's energy goes into raising the temperature of those surfaces and the air in contact with them. As the day progresses, a dome of warm air forms over the city as convection transports heat from the surface to higher in the atmosphere. After the sun sets, temperatures remain elevated above the vegetated areas around the city or town, and so the heat island effect persists during the night as well. There is some evidence that the Urban Heat Island effect modifies the rainfall patterns around cities, at least in the summertime. THE EFFECT OF THE URBAN HEAT ISLAND ON GLOBAL TEMPERATURES Because urbanized land areas cover only a very small fraction of the Earth, the effect of the urban heat island on global average temperatures is very small. BUT, because most thermometers are located in urbanized areas, and those areas tend to become more urbanized over time, some scientists believe that there is a spurious warming signal in global average temperature estimates computed from global thermometer data. While the global temperature dataset developers have attempted to make adjustments for this effect, currently there is no way to know just how accurate those adjustments are.